Check out the most recent legislative action alert on SB560! Oklahoma lawmakers are poised to approve vouchers, also known as Education Savings Accounts, this legislative session. 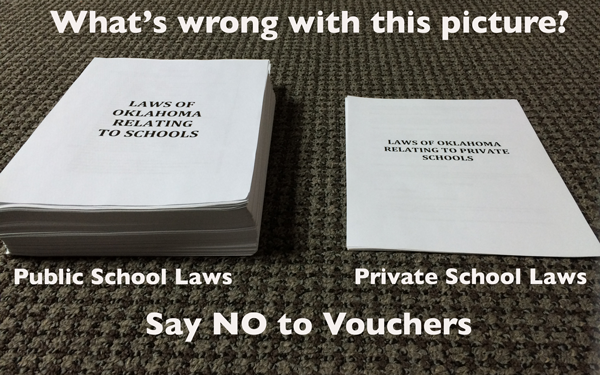 This is NOT OK. Vouchers aren't a solution for helping build a solid education foundation for Oklahoma's children. Oklahoma's policymakers must work with parents and education leaders at all levels for real solutions to support the 692,000 students in their public schools. There are no shortcuts. Lawmakers must say NO to vouchers! Vouchers will DIVERT money from public schools while subsidizing private schools for wealthier families. Vouchers LACK ACCOUNTABILITY for taxpayer dollars and student achievement. Vouchers will REDIRECT limited resources from the true schools of choice -- the public schools that serve more than 90 percent of Oklahoma's school-age children. Oklahoma has school CHOICE. Oklahoma has family-friendly transfer laws. More than 40,000 students transfer to a school in another district, while several thousand students transfer to a different school within their district. More than 80,000 high school students choose to participate in Career Tech classes. A majority of parents OPPOSE using taxpayer dollars to pay for private school. Vouchers are UNPROVEN as a means of consistently or significantly improving student achievement for all students. Vouchers could shift millions away from the public schools that serve 90 percent of Oklahoma's school-age children. The cost could be much higher. The cost estimate assumes private school enrollment remains at the same level as 2012,* that the number of students in homeschool remains level and that the socioeconomic makeup of students in private and home schools mirrors that of today’s public school students. (*Source: National Center for Education Statistics). A study from the Indiana Department of Education found that vouchers cost public schools $40 million in 2015-2016. The costs in Oklahoma would be even greater because Indiana has tighter eligibility requirements. In the name of accountability, state leaders have piled on a growing amount of mandates and paperwork on public schools. Vouchers lack transparency in how taxpayer money is spent and for how students are performing. Every dollar of money to public schools is coded and tracked, and strict limits are placed on how much schools can spend money for administration and other areas. Private schools would not be limited in how they spend voucher money or be required to account for expenses. Public schools must give state-mandated tests, adhere to state-adopted academic standards and face sanctions if students aren’t performing well. The proposed vouchers allow recipients to largely avoid any student achievement-related reporting and mandates. Oklahoma families have made their choice. More than 90 percent of Oklahoma families picked public schools, and enrollment is growing! Lawmakers should focus on helping students where they are -- public schools. Want school choice? We have it! More than 40,000 students transfer to another school district every year, thousands more students transfer to different schools within their districts and more than 80,000 of the state’s high school students choose classes available through the state’s career technology system. In 2015, Oklahoma lawmakers approved the statewide expansion of charter schools. Vulnerable students face a variety of challenges when it comes to education. The best way to meet the needs of Oklahoma’s most needy students is to ensure their public school is filled with great leaders, great teachers, plentiful resources and support to meet their daily challenges. Research on voucher programs in other states shows vouchers have been costly but offers no confidence that vouchers will improve achievement among participating students. Oklahomans know the best investment is strong public schools. A survey conducted by a pro-voucher group found that Arizona's voucher program disproportionately serves white children and those from more affluent families. ﻿We'll send you an email when there's legislative action you need to know about. Don't know who your legislators are? Click here to find out.